Wes and Tyler reveal the secrets of how they record ludicrously high resolution video and screenshots on the Large Pixel Collider . The LPC's four GTX Titans give it the power to record 7860x1440 video across three Viewsonic VP2770 27-inch monitors. To record lossless video without compromising on framerate or graphics settings, we use Dxtory with the free Lagarith lossless codec . When we harness the LPC's power to record 4K screenshots, we turn to a special technique called downsampling. 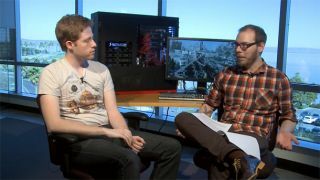 Tyler and Wes talk about how to tweak Nvidia display settings to render games at 3840x2160. That's 8,294,400 pixels.